The violent clashes that plunged the south of Kyrgyzstan into chaos since June 10th have led to an acute humanitarian crisis, with hundreds of people wounded and large displacements of population. According to official reports, at least 170 people have been killed and 1,700 wounded in the past five days. MSF teams are arriving on the ground on both sides of the border between Kyrgyzstan and Uzbekistan to provide emergency assistance to those in need. In Kyrgyzstan, MSF’s emergency medical stock in the city of Osh has already been dispatched to local hospitals. More medical material, drugs, cooking sets, plastic sheeting for shelter, water containers, and hygiene kits are en route to the south of country today. Meanwhile, a MSF medical team will soon arrive in the city of Osh and from there try to reach Jalalabad, the other main city where serious violence has been reported. They will visit health structures and places where people have taken refuge near the Uzbek border after fleeing the violence and start providing assistance to the victims and displaced. 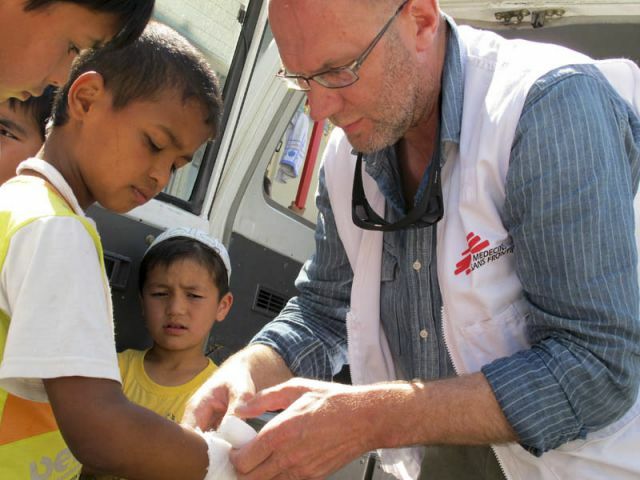 On Sunday the 20th of June MSF expanded medical assessments to several neighbourhoods in Osh. “In addition to the many hospitalised victims who may need medical attention, one of our biggest worries is for the hundreds of people who have been wounded and have no access to health care. Some of them are afraid to go to health structures or to move from where they are, others have fled far from any health structures near the border area. We are also concerned by the lack of access to drinking water - water systems were shut down for some days in Jalalabad, and the lack of food and basic items as hundreds of houses were looted, destroyed or burnt during these violent events”, says Alexandre Baillat, MSF’s Head of mission in Kyrgyzstan. Thousands of those who have fled the violence have sought refuge across the border into Uzbekistan. About 75,000 people have officially been registered as refugees in Andijan, a province located on the Uzbek side of the border between Uzbekistan and Kyrgystan. Uzbek authorities have started to set up camps and local hospitals are treating the wounded people who have come across the border from Kyrgyzstan.